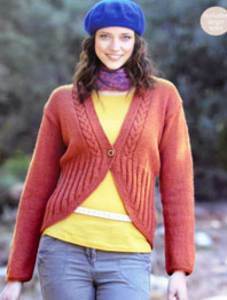 The latest DK knitting patterns for women including summer tops in the latest yarns plus sweaters, cardigans, boleros, tunics, gilets and jackets from Patons, Sirdar, Wendy, Twilleys, King Cole and Stylecraft. 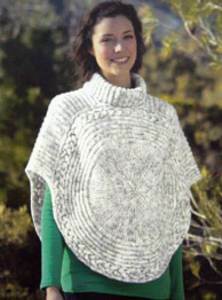 New womens DK knitting pattern designs added regularly, so bookmark this page! Sublime 6073. Womans furl veste and furl worked in Sublime Egyptian Cotton DK to fit sizes 81 -107cm (32-42in). Sirdar 7210. 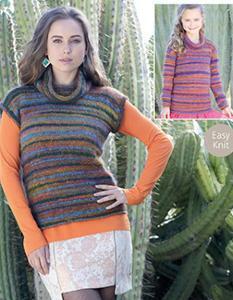 Womans DK top with patterned panel to fit sizes 81 -107cm (32-42in) and shown in Sirdar Soukie DK yarn. Stylish double breasted wrap has shawl collar and integral sleeves, in broad rib with side cable panel. To fit 81-107cm (32-42in). Wendy 5788. 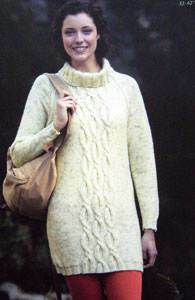 Womans DK knitting pattern for long and short sleeved cabled cardigans to fit 81-107cm and 32-42ins and shown in Wendy Ramsden DK. Easy sweater with set in sleeves has crew neck or narrow collar. 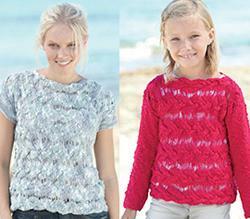 Shown in Sirdar Crofter self-patterning DK, to fit children and adults 61-117cm (24 - 46in). Sirdar 8983. Short sleeve top with V neck and tie, knitted in one colour or with contrast, to fit 81-137cm (32-54in). 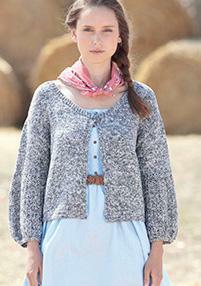 Fitted sweater from Sirdar with deep old shale lace borders plus easy moss st wrap in two widths. To fit 81-107cm (32-42in). 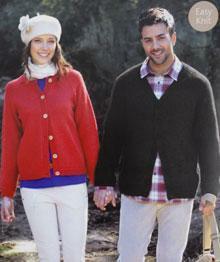 Classic easy knit round or V neck raglan cardigan for men or women in DK from Sirdar. To fit 81-117cm (32-46in). 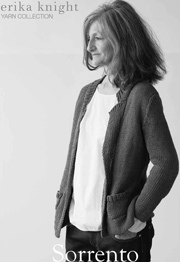 Curved edge cardigan from Sirdar with cable edging is an interesting construction with lower body worked downwards in one piece, upper body also worked in one piece to armholes. Includes larger sizes, 81-137cm (32-54in). 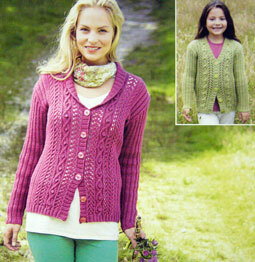 Cardigan with V neck or shawl collar in 2x2 rib has lace and cable front panels, shown in Sirdar Country Style DK. To fit women and girls 61 -117cm (24-46in). Roll neck tunic with raglan sleeves has cable panel (front and back) on reverse st st background. Shown in Sirdar Click DK, to fit 81-107cm (32-42in). 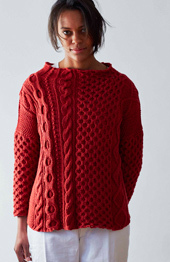 Sweater with long or short sleeves has leaf lace panel knitted sideways in 2 pieces, back is plain, shown in Sirdar Americana DK. Includes larger sizes, 81-137cm (32-54in). Easy and quick to make V neck sweater uses one small and one large needle to create open reverse st st. 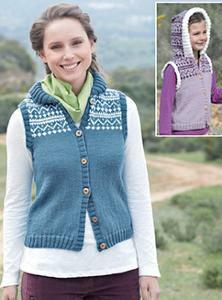 Shown in Sirdar Americana DK, includes larger sizes: 81-137cm (32-54in.